Owen Ogletree (director of Brewtopia Events LLC) gathered together fellow beer lovers Radi Nabulsi, Martha DeHart, Jeff Rapp, Dean Graves, Thel Melton, and Lari Cowgill on March 21, 2004 to sample and comment on several pairings of beers and cheeses from around the world. The carbonation and elegant maltiness of a fine beer go well with the creamy texture and thick mouthfeel of cheese. The biased opinion that wine goes best with cheese is simply not true. Wine is very acidic with cheese -- it quickly washes the cheese coating (and flavor) off the tongue. Beer nurtures the flavors of the cheese in the mouth, thus producing quite an interesting array of remarkable combinations. Our cheeses discussed below (except for the Banon and Cabrales) came from Earth Fare supermarket -- easily the best cheese selection in Athens, GA. All text and photos are by Owen Ogletree. Drop Owen an email to share your comments and opinions. Ten of our favorite Beer Bars and Brewpubs. Pilsner Urquell is a classic Bohemian Pilsner from the original Pilsner brewery in the Czech Republic. We paired this golden lager with a delicious aged cheddar from England. The cheese was three years old and had earthy, full flavors that were rich and complex; thus the Pilsner was a bit too smooth and light in flavor for this cheese. Cheddar gets a sharper taste the longer it matures, and it seems that a spicy Belgian Blonde Ale might be a better match for this aged cheese. 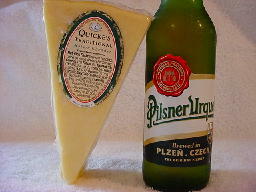 Pilsner Urquell is a fantastic match for younger cheddars with milder flavors. Hoegaarden is a remarkably light, refreshing ale with a surprising depth of flavors and complexity (orange peel and coriander are added during the brewing of this beer). It has a slightly sweet, honey character with orange and herbal notes that are very appealing. 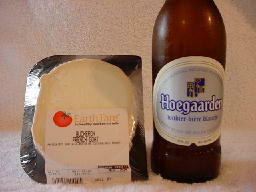 The goat cheese was an impressive match to the Hoegaarden -- the beer and cheese both had an herbal tartness. The slight saltiness of the cheese also highlighted the mineral/spicy character of the Witbier. This would be a great combination to enjoy on a beautiful day in spring. 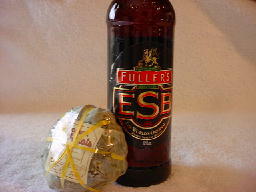 Fullers ESB from London is the world classic English Strong Bitter and has flavors of caramel, malt, and woody hops. Banon is a creamy, unpasteurized, natural rind cheese from France that is wrapped in chestnut leaves. The woody, nutty, herbal quality of the cheese matched perfectly with the hoppy, malty character of the English Pale Ale. 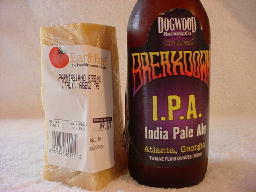 Dogwood India Pale Ale (made in Atlanta, GA) exhibits a dry, mineral-like bitterness the liberal use of American hops in the boil. What could be better with this beer than a salty, mineraly, dry parmigiano cheese from Italy? We were careful to select an authentic Parmigiano Reggiano cheese that is very firm in texture, piquant in aroma, and salty/crusty in flavor and mouthfeel. This beer and cheese combination received some votes for best of the afternoon. This is not a pairing for the faint of heart! 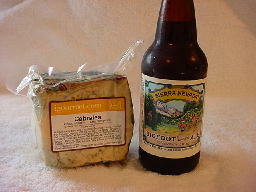 The Bigfoot is from the Sierra Nevada Brewery in Chico, CA and the Cabrales cheese hails from Spain. Packed with a macho amount of malt, hops, and alcohol, Bigfoot is known as one of the world's most intense and flavorful strong ales. Likewise, Cabrales cheese is often described as "mouth-numbingly intense," and this is definitely not an overstatement. Cabrales is made from a blend of cow's, goat's, and sheep's milks and is matured in caves in Spain until it is loaded with blue molds. This cheese actually smoothed out the flavors of the Bigfoot and made the beer taste mild! Having this combination in your mouth at once makes for an experience you'll never forget. This pairing was voted as the best of the afternoon! After all these beers and cheeses, we were ready for dessert! Rogue beers are produced at the beautiful Rogue Brewery in Newport, OR and are widely known for their aggressive, West Coast flavors. The Chocolate Stout has additions of real chocolate and is slightly sweet and creamy. 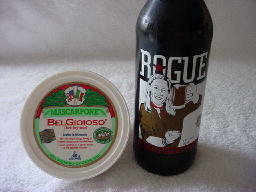 We added a hint of molasses to a tub of creamy mascarpone cheese and created a wonderful complement to the beer. This cheese is often used in desserts like tiramisu, and the bitter chocolate character of the molasses melded perfectly with the similar flavor profile of the beer.